Wahi Pana are celebrated, legendary and traditional cultural places. These are areas that have significance for the people who live here. The Kōloa Field System is one of those celebrated, special places. The Kōloa Field System is characterized as a network of fields of both irrigated and dryland crops, built mainly upon one stream system. 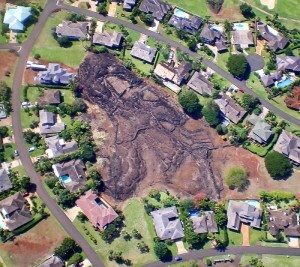 This aerial shot of wahi pana ʻekahi at the Kiahuna Golf Village is typical of the type of terrain the Hawaiians dealt with in the Koloa field system. The photo gives an idea of what this wahi pana would look like if crops grown during the hey days of the Koloa field system were planted, the ʻauwai restored and running with water to irrigate the crop. There are large areas of outcroppings interspersed with pockets of dirt, some accessible to water and others not. The areas not accessible to water were planted with sweet potatoes. Rocks, as plentiful as there were here, were used to form mounds around the potatoes to wrap the vines around, add nutrients and to gather condensation. This field system was a thriving and productive enterprise for over 500 years. Taro, sweet potatoes, banana, cane sugar and other plants grew abundantly here. Interestingly, the US Soil Conservation Agency says the land in this area is totally unsuitable for agriculture due to poor soil composition and arid conditions. This is the same land that supplied the forty‐niners in the California Gold Rush over 10,000 barrels of sweet potatoes annually in the 1850s. The area also supplied the North with all their sugar during the US Civil War. The 100‐mile ʻauwai system that irrigated the crops of the field system are touted as a hydrological feat. Irrigation ditches traveled in all directions to irrigate crops grown on this rough landscape.